Above is a draft of a "Character Creation Worksheet" for Holmes Basic, planned as part of my Holmes Ref series of references sheets. I designed it for character creation, but also to be used as a character sheet. If you are using it as a character sheet, you can simply circle the relevant selections/information. There is also a quick reference box near the top of the page, and some reference tables at the bottom. 1. No Str or Wis mods per Holmes, but I left the rows blank so they can be added easily. 2. For reasons of space, the M-U Intelligence modifiers are a bit off for Ints below 10. 3. The Charisma numbers involve a bit of an extrapolation. Holmes (pg 5) only mentions a maximum of 5 followers for Charisma "below 13" and a "large number" for a Charisma of 18. This is probably based on the OD&D Vol 1 table, but it doesn't match it exactly ("below 13" (10-12 Charisma should be a maximum of 4 followers). Also, as with the M-U Int modifiers, my columns don't always match the original. 4. I had two purposes in mind for the numbers 1-12 in the equipment table, neither of which is essential to character creation but that I thought could be useful. One, they allow for random d12 rolling on the table, for example if a DM wishes to use the sheet to generate random weapons, armor, other equipment for an NPC, or to generate random items found in a room. Two, the numbers 1-12 represent the original 12 weapon class from the Man-to-Man Melee Table in Chainmail (pg 41). These classes are roughly ordered in length and/or weight from lightest/shortest to heaviest/longest, and the class was used in the Man-to-Man combat starting on page 25. OD&D didn't mention any specific use for these classes, but did keep the weapons ordered in this fashion in the equipment table. Holmes likewise kept the weapons in this order in the equipment table. In the module B2, Gygax lets the guards in the Keep that wield polearms automatically win initiative on the first round of combat, which shows one possible use for this information. I left Halberd out of the table for space reasons, as it can be considered a form of Pole Arm. Both cost the same and are the same class in Chainmail. This is still in the tweaking stage, so feedback is appreciated. The above image is from a recent auction for a one-page TSR memo about a Founders Day celebration for employees in 1980 (the end price for the auction will blow your mind). The memo is on manila TSR stationary that includes the TSR Wizard logo in the letterhead. Per the Acaeum, this logo was in use at TSR from Dec 1978 to mid/late 1980. "Today TSR is a multi-million dollar publisher and Dungeons & Dragons is the leader in the field of "Adventure Gaming" (simulation games, wargames, science fiction games, role playing games, miniature games, etc ...). TSR now employs more than 95 people and there are close to one million copies of the Dungeons & Dragons Basic Set in circulation (picture the number of players that there must be). It takes no genius to see what a tremendous future TSR has and the unlimited potential that can be realized if we all continue to support and serve the company as well as we have in the past. It is up to us!" The memo is not signed, so it's not clear to me who wrote it. 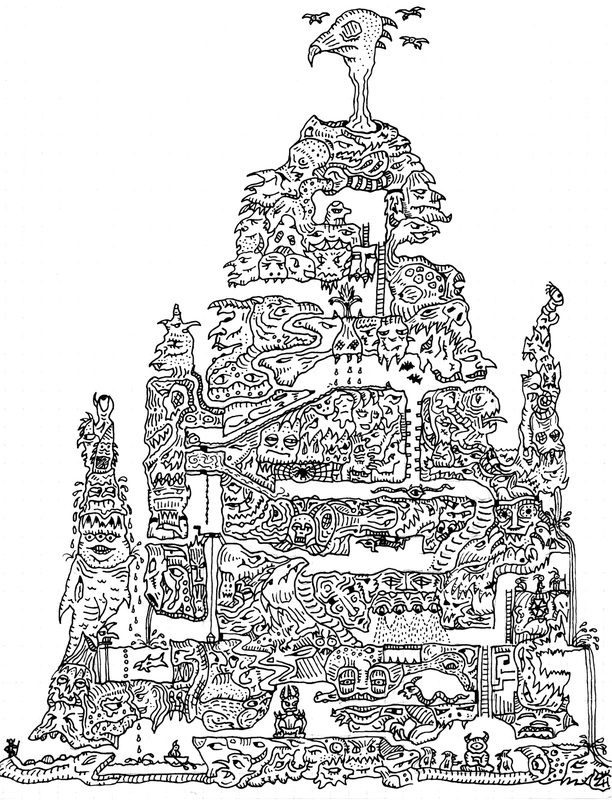 It may have been Gygax or one of the Blumes, although it refers to Gary Gygax and Brian Blume in the third person. The celebration itself was held at the "Red Eye Restaurant located south of Lake Geneva on Highway BB". The restaurant is no longer in business; this history article briefly mentions the Red Eye tavern on Highway BB, now named Linton Road. Coincidentally, the Collector's Trove just auctioned a similar memo from 1981, from the collection of former employee Allen Hammack, author of C2 The Ghost Tower of Inverness. This memo uses the later TSR Face Logo. The text is partially obscured with an index card, but from what I can see, most is identical to that from the previous year, and the party was once again held at the Red Eye. I can see that the "close" (to one million) from the above memo has been changed to "over", though the rest of the sentence is obscured. Note that this would be after the Moldvay Basic Set was released in early 1981, so any sales data here would include sales of both sets. Some bits of interesting emphemera from an exciting time at TSR, when sales and national attention were skyrocketing. 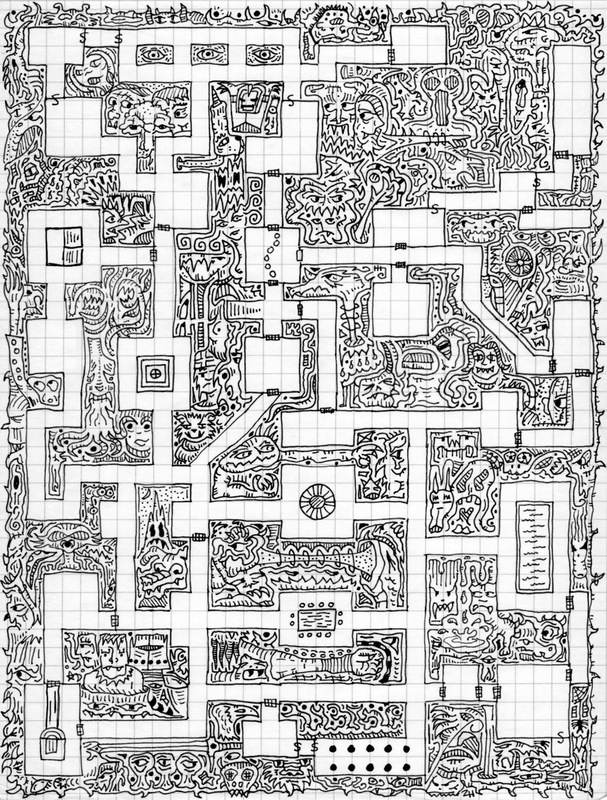 Part 53: "The Room Contains a Giant Snake"
The final part of the Sample Dungeon is the 3-part tower of the evil magic-user, who also frequents Room F where he is first described. In this part I'll cover Rooms S and S1, leaving S2 for the next post. This is the only part of this area actually shown on the map; the other two rooms (S1 and S2) are situated directly above it and are accessed by a staircase. Room S is part of the dungeon and is the only circular room in the dungeon. Does it date back to the time of Zenopus who excavated in his cellars or did the evil magic-user, who is trying "to take over the dungeons", dig it under his tower? On the published map, we can estimate that the thaumaturgist's tower is only about 300 feet from the ruins of Zenopus' tower. The roof of the room is 25 feet above, which is the same height as the entrance stairs at the start of the adventure, so this tower is either on the same hill as the ruins, or a nearby hill of similar height. As you can see above, Room S on Holmes' original map is larger in relation to the other rooms of the dungeon. For example, Room S is larger than Room F. The published map puts it only about 40 feet across, but is should probably be more like 50 or 60 feet. The room has four entrances/exits, including doors to the north and south, a secret door "opened by pressing a hidden catch" under the stairs and leading to a tunnel to Room F, and a trap door on the ceiling accessed by a spiral staircase going around the wall. The staircase is said to start at the north wall and make one full turn, which would place the trap door directly above the north door to the room. So the map only shows part of the staircase. While the room can be accessed from other rooms in the dungeon, the evil wizard has a suitably hideous guardian for his tower - a giant snake. This is the only other thing in the room besides the staircase. Serpents of unusual size are fairly common in pulp fiction. Conan in particular encountered them on several times, including some associated with wizards. For example, in the Scarlet Citadel (1933), Conan is trapped with a giant snake in "the tunnels and dungeons wherein Tsotha [the wizard] performed horrible experiments with beings human, bestial, and, it was whispered, demoniac, tampering blasphemously with the naked basic elements of life itself". This being an introductory adventure, the snake here is not terribly difficult. Holmes gives it 2 HD, AC 6 (explicitly described as "leather and shield") and a move of 100 feet / turn. It would also have the default 1 attack for 1d6 damage. There are no giant snakes in the Holmes Basic Monster List, so this is another example of the "Giant Animals or Insects" from the Monster List in the manuscript, which was deleted by Gygax. There are no snakes in Chainmail, but OD&D Vol 2 mentions "snakes" in the description of "Insects or Small Animals", which are creatures with 1 hit point to 1 HD, AC 8. The entry for "Large Insects or Animals" covers "giant ants and prehistoric monsters" having 2 to 20 HD, so one might interpret this as covering giant snakes. OD&D Vol 3 lists Giants Snakes on Monster Level 3 (pg 10), suggesting about 3 HD, and on the Swimmer table. The extra descriptions of Aquatic Monsters on page 35 include Giant Snakes, but these have 6 HD. The Greyhawk Supplement included Giant Snake in the list of "Attacks and Damage by Monster Type" (i.e., variable monster damage), but we don't see that information included here, of course, since Holmes didn't include that information in the Monster List - it was added by Gygax during editing. Moldvay Basic and the AD&D Monster Manual each include a differing assortment of Giant Snakes, none of them close to the snake here. In those books, the lower HD snakes are poisonous, and the constrictors are much larger, having 5-6 HD. As published, the only changes to this room are to add the snake's hit points (13) and change trap door to "trap doors". This seems to be a mistake since the first paragraph still refers to a single "trap door". 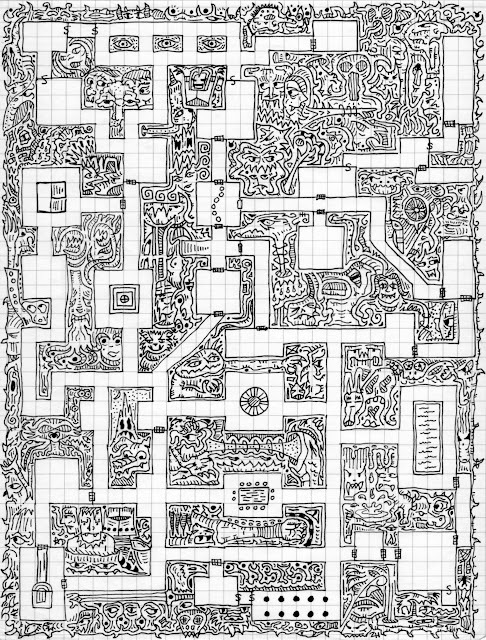 This is the "ground floor of the magician's tower", and with S2 above, the only "rooms" that are part of a building in Portown rather than the dungeon. The description indicates there is a street to the north of the tower, which would be between this tower and the ruins of Zenopus. Another spiral staircase leads up to a trap door to the next floor. There's a brief description of the contents, all mudane: a fireplace (suggesting the tower has a chimney), cooking utensils and a few chairs. As you might guess, since it's all basically descriptive there are no changes to this room as published. Go Back to Part 52: "No End to the Rats"